Every couple wants their engagement ring style to reflect their personality and preferences, and there is no better way to do that than with a custom engagement ring. LoveToKnow Engagement Rings was privileged to speak with Dana Stone of Engaging Rings, LLC about today's hottest styles and how couples can make their ring a unique expression of their relationship. LTK: What are today's hottest engagement ring style trends? 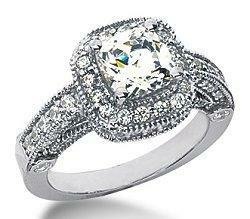 DS: The hottest diamond engagement ring is the pave setting engagement ring. It consists of a center stone with beautiful micro pave set diamonds all around it. It is micro pave because a microscope is needed to set the numerous small diamonds. The pave ring is done with all different shapes and sizes for the center stone. The pave makes a beautiful brilliant ring. Another popular style that is still strong is the classic three stone ring. I personally recommend that the center stone be at least twice the size of the side diamonds to enhance the center stone and not compete with it. This can be done with three round brilliant cuts, three princess cuts, a center princess with trillions on the side, just to name a few examples. LTK: What diamond shapes are most popular in different ring styles? DS: For many years the most popular diamond shape has been the round brilliant cut and it will stay in center stage. The princess cut is a close second. Other shapes come in and out of fashion. The cushion and asscher cuts, popular in the early 1900s, have experienced resurgence in the last several of years. They look terrific in the new antique style pave mountings. LTK: What precious metals are couples most interested in today? DS: White gold, palladium, and the most prestigious platinum are today's metals of choice. Even though yellow gold is very in fashion, people still want their white diamonds in white metal. LTK: Since the diamond solitaire is still popular, how are couples making it unique? DS: There are many ways to spruce up an old classic. The new take on the diamond solitaire is to make it more modern and bold. Clean bold lines are changing the look of the traditional Tiffany's solitaire. Brides are also adding multiple pave bands to it in an array of colors. LTK: When adding color to a ring, what do you recommend? DS: Adding colored gemstones to an engagement ring is a great way to give a classic ring a unique look with an edge. Personally I prefer the colored sides stones be precious gemstones, such as rubies, sapphires, or colored diamonds -- just to name a few. I do love adding green, but emeralds can't take the kind of wear that the above-mentioned can. I don't like the idea of adding topaz or tanzanite to an engagement ring I think it can cheapen it. A good alternative for a budget is to stay with sapphires; they come in a wide range of colors. They are from the corundum family; which have high hardness and a lot of sparkle if they are cut well. LTK: How can you help a couple discover their best engagement ring style? DS: In helping a couple determine the best style for them, I discuss their lifestyle, personal styles, and what is most important to them -- center stone, mounting, or both. 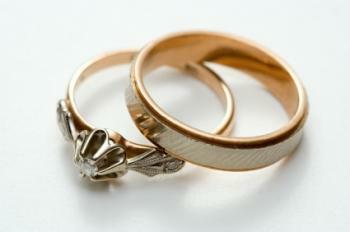 I also determine what kind of wedding band they will want to wear with their engagement ring. I always ask if price were not an issue what would be their dream ring? I want my customer to wear their engagement rings and enjoy them. If you don't find out what the customer's goals are, their ring could end up sitting in a drawer because it does not fit their lifestyle. LTK: What are the benefits of working with a custom designer instead of buying a ready-made ring? DS: My experience and knowledge will greatly benefit any customer working with me. Most customers, and even jewelry salespeople, can't really spot poorly cut stones or average workmanship. Most of the rings in a retail store are inexpensive with poorly cut, mediocre diamonds and second rate workmanship. Even though the price is inexpensive they are overpriced for what they are. Or you will find well-made, high-end designer rings that are very expensive, and extremely overpriced -- you are paying for the brand, not just the quality. All diamonds have sparkle and are beautiful and I want my customer's rings to have the most sparkle and the finest workmanship for an affordable price. I give my customers value no matter what they want to spend. LTK: What can a couple on a budget do to purchase their dream ring? DS: There are many things I do to work with couples on a budget to obtain their dream ring. Sometimes it's a very expensive mounting they are in love with that is soaking up their budget. I can recreate the same look using less diamonds, but a similar style. Often they want a large diamond, but have the budget for a smaller one. There are many practices I use to make a diamond appear larger. I have ways to double the look of a diamond. 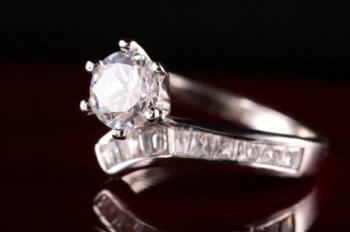 LTK: What is the biggest mistake you see couples make when shopping for an engagement ring? DS: The biggest mistake I see couples making when shopping for an engagement ring is basing their decision on a piece of paper that proves their diamond is certified. A diamond is a natural material formed by the earth over billions of years of heat and pressure. There is so much more to a diamond then color and clarity. How the stone is cut and the proportions have a large effect on the beauty of a stone. It takes a trained eye to decipher the exceptionally fine diamond material from the average. I do believe in buying certified diamonds, but not all labs are created equal. G.I.A. certificates are the most respected, and therefore those diamonds command the highest price. Some labs have very compromised grading on their diamonds. The 4 C's, (color, clarity, cut, carat weight) although incredibly helpful in determining value, are not the only answer. You need an expert eye to spot fantastic diamond material. Dana Stone has a BFA in Jewelry Design and Metal-Smithing and a graduate gemologist degree from the Gemological Institute of America. After 14 years of experience managing precious jewels at Neiman Marcus and fine jewelry for Saks Fifth Avenue, Dana ventured out on her own to create high quality, exquisitely detailed jewelry through her own company, Engaging Rings. For more information about Engaging Rings, visit EngagingRings.com or arrange a visit to the Chicago store.